Introducing The X-Treme Facial! 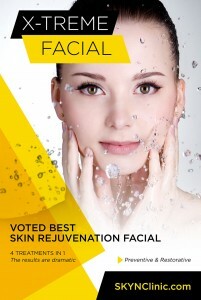 An award Winning Anti-aging Facial! This signature facial, only found here at SKYN Clinic, treats all symptoms and conditions of aging, by combining the best facial treatments in to one service. We often need more than one type of treatment to get rid of our aging concerns. This all-inclusive anti-aging facial, lifts and tones your facial muscles, and leaves you with age-less, glowing skin immediately! Combined with SKYN Clinic Custom Blended Skin Care products, and four celebrity best kept facial secrets, this facial restores and prevents dull, aging skin, dramatically! This sought after treatment re-defines your facial structure and speeds up collagen and elastin production. Re-gain your youthful glow, no matter what age! WHAT IS THE X-TREME FACIAL? The X-Treme Facial was designed with you in mind. Must facials only treat one condition at a time. Why not, take care of everything all at once? That is exactly what the X-Treme Facial does. The X-Treme Facial: lifts & tightens, speeds up collagen and elastin production, promotes cell turnover and exfoliation, deep cleans and kills bacteria found on the skin, while leaving you with youthful, glowing skin. One treatment takes 1.5 hours. 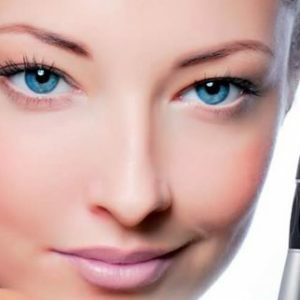 You can get the X-Treme Facial done once a week, every two weeks, or as monthly maintenance. The frequency depends on your age and skin care concerns/needs.